Prepare everything you will need (e.g., pen, needle, alcohol swab). Clean the extremity of the insulin cartridge with an alcohol swab. 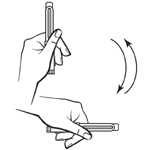 Attach the needle to the pen and remove its shields. Prime the pen. Dial two units, hold up the needle upwards and press the injection button until you see a few drops of insulin. Repeat if necessary. Set your dose by turning the dial to the correct number of units. Preferred injection sites are the abdomen (particularly), thighs and top of the buttocks. 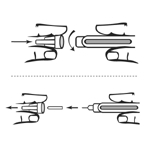 Rotating injection sites and injection points is recommended. Clean the injection site with soap and water. If an alcohol pad is used (e.g., at the hospital), allow the skin to dry before proceeding with the injection. Insert the needle into the skin and press the injection button all the way in. 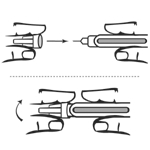 Remove the needle carefully from the pen and recap the pen. Needles should only be used once and then thrown away since they may be dirty and blunt. Always use a sharps (disposal) container to safely discard used needles. Return the container to the pharmacy when it is full or you no longer need it. Always remember to wash your hands thoroughly to reduce the risk of infection at the injection site!